It will not matter how many "MPS Training Programs" start scrambling out of the darkness. Hire all the "MPS Experts" in the world, it won't make a difference. Get the hottest, newest, collection agent that can generate a highly professional appearing yet canned proposal. Toshiba, Konica Minolta, Ricoh, Samsung, Xerox or Canon MPS training programs are doomed to fail and will result in nothing more than frustration and lost potential. Why? Because Old dogs abhor change and Dogma flourishes. I keep going back to this saying, "...at the beginning of the month, we all sell solutions, but in the last week of the month, we move a box..." - the copier dealer/manufacturer sales manager's mantra. This past week, the last week of the month, I came face to face to face(3 times) with this old, worn out, schlocky, scheme - standing shoulder to shoulder with my clients. All I could do was shake my head, apologize and supply my clients with "20 Deadly Questions" no copier sales person ever wants to answer - they walked into a sales buzz saw - one rep called for reinforcements from his manager, that was a mistake. "..it may not be your fault, but it sure as heck is your responsibility..."
Think of how a captain is responsible, when his ship runs into an iceberg while he is asleep. So it is not difficult for me to look my client, my partner, straight in the eye and say, "I am sorry this happened and I will make sure it never occurs again." This week I needed to apologize twice - with two separate clients - over three unique instances. Here's the twist, neither me or anyone on my team committed a fault - I was apologizing for the actions of my competitors. "Have you ever met a copier salesman you liked?" "What's the difference between a Software salesperson and a Copier salesperson? The copier guy knows he is lying to you." You have heard them all and more. "Stereotypes". And what's the first rule of stereotypes? Stereotypes are based on fact. First Client: One of my larger MPS engagements, a three year project. Our(by "our" I mean my client and me) goal in year one is to manage and control the fleet refresh, implement supply management, and save millions. Our implementation includes continuous, about 3/week, and detailed site surveys and interviews in order to match requirements to a preset list of hardware selections. Simple enough. Because my list of supported devices is purposely narrow, over the next three years, an occasion will arise where the departmental requirements do not fit my current product line- my client may need a machine that I do not sell. Interesting conundrum, wouldn't you say? What to do...what to do...? If you go to the true definition of MPS, you already know. Well, as luck would have it, the opportunity came up, and I needed to make "copier" recommendations. I felt comfortable suggesting brand "C", again, a line I do not carry. So I specified three optional units, talked with friends in the industry and obtained pricing, my client also made contact with a local sales rep that had been "bird-dogging" this account for years. They figured it was a good idea to "throw a bone" at the local - I agreed. What resulted was a classic, end of the month, sales onslaught - worthy of all the "bad rep"we confront every day. I could only shake my head, laugh and deal with the Delayed Stress that was triggered by brushing up against my past. For whatever reason, the local sales rep felt it necessary to bring in his manager. Ah yes, the infamous "closer". Verbal pricing that didn't match the written quote. The written proposal was a price and data sheet, only. Non-existent SLA's. Literally, the service agreement is empty; no min, no overage, no response time - nothing. Just a per click charge. Perceived short-comings are blamed on competitors - non-compliance with HP WJA was blamed on HP, not brand "C's" unwillingness to write plug-ins. The Close - "Always Be An Idiot"
"...all I need is your initials, here on my proposal, and I can have your new machine delivered by Friday. (end of month) No need to issue us a P.O. - your word and a handshake are good enough for us..."
LOL! This is an actual, real, quote. Sure, the sales manager doesn't need a P.O. - he doesn't WANT a P.O. because a P.O. would have T's and C's on it. Generating a P.O. requires some sort of oversight and review - he doesn't want that, he's got a number to hit by month's end. Listening vs hearing? His concerns over those of the prospects? "Box" over "solution"? And this was the MANAGER. What "genius" didn't know, because he never asked, is that this particular client had been run over for a decade by brand "X" having Department level users "... initial a quote..." to initiate an order. Machines had been showing up, at any time, without review for years. No oversight, no review, no compliance or network standards. I put together a list of 22 questions for my client to pose to this "crack team of sales people" - a "buzz saw". No "trick" questions, and not meant to "slam" the competitor, simply points of clarification. Clarification for my client's sake, not brand "C". The really unfortunate issue, these folks will get the deal. And because of month-end, I was able to witness ANOTHER assault. Client Number Two: MPS small engagement, total of 21 devices, three in need of refresh/upgrade. This little fiasco was a result of both an inattentive vendor, brand "I/R" and a pushy cold call, brand "K/M". Weeks after I made contact and installed our remote monitoring software, Brand 'K' walked through my prospects front door. My prospect allowed him to look around, ask some questions and prepare an alternative. Instead of calling or emailing this sales rep felt it appropriate to simply "stop by" to make his presentation. This, I am sure, was is Sales Manager's idea, as he was in tow, and the end of the month was approaching. The presentation was a disaster. Simple sheets of paper covered with pricing and options, impossible to decipher. His price, nearly twice as much as mine. His "recommendation", a huge, centrally located, color/b&W MFP, the removal of ONE color and 3 black and white laser printers, and complete indifference to the existing Canon 5075(with 28 months remaining) - he ignored it. The topper was my client realizing that although the price was twice as much, it included the hardware payment only. "...look at this, the service rate is mentioned up here, but they quote the volume based monthly payment at the bottom of the page, in a smaller font..."
I will be darned if that wasn't the truth, I saw it with my own eyes. She did not appreciate the unannounced appointment, she did not like the "heavy handed attempt" to get an order and she was absolutely livid over the "small print" pricing. One more sorry aspect of this was the fact that the incumbent, brand "I/R" never contacted their customer(my prospect) to possibly upgrade the three units I did. When my prospect asked for some attention, the "I/R" rep simply sent over a contract for signature - no phone call, no appointment, no needs analysis - nothing but an 8 page contract waiting for ink. So, yes - I apologized. Again. I apologized, no less, for all the bad sales people in the world. All the used car guys, the evening telemarketers, the boiler room bandits, and the smiling real estate sales people. For all the lousy Chase customer service reps, for all the terribly unhappy retail sales people - I apologize, my bad. 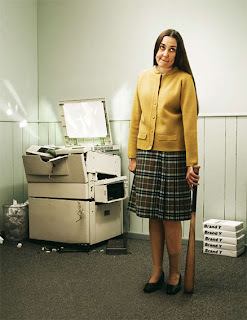 I know not all copier sales people are like the ones illustrated here. But think about it. In this one week, THREE separate, industry leading firms, have been represented by third class, old school, hacks. Some believe that MPS will grow with this type of talent? Really? Honestly? I do not believe that ANY amount of "MPS Training" can help. If you are putting together a MPS Practice or looking for a Managed Print Serivices Partner, beware, be very much aware. What were the client needs that your dealership couldn't handle? No disrespect, are you sure you're working in the right place? Have you ever worked for one of the larger manufacturers, ie, X, IR or KM? Am I sure? Ask me in 5 years...is anyone ever sure? No disrespect taken - at all. I know what you are thinking and I understand completely. There is, of course as with every story, a backdrop. I did not want to weigh down the article with more detail than necessary. Yes, I spent 2 years with Oce, 2 years with a small Panasonic dealer and served three years in the IKON penitentiary (just kidding). Before that, I spent nearly 15 yrs selling computerized accounting systems(hardware/software. I know what it means to force a square peg into a round hole. Nobody wins. And I know what it means to ignore the competition when they "crack into" an account of mine. I am now with an IT/Technology VAR and the MPS division is HP centric(OPS) - but our selling model for MPS is as far away from hardware sales as possible. Hence the very close relationship with the mentioned clients - in that they allow me to guide them in the rare occasion that I can not provide a given chunk of H/W. Believe me, it is a satisfying position to be in, and one that displays a true "Client-Centric" philosophy. Also, I am sure, a scenario that may give a boat load of copier Sales Managers fits...ha! Thanks for the comment, keep reading! Gotta love that "Box Dropper" mentality. Sometimes I think I'd like to get back into the "game" from my old perch Facilities Management (FM) and MPS would seem like the perfect new hunting ground. Then a article like this comes along and convinces me in about 2.5 seconds to stay in training. I think many of the prospects are so conditioned to the crappy approach from Copier reps and dealers that if anyone comes along and treats them like an actual customer they'd die of shock. I really appreciate all of the competition because it does make my job allot easier. The manu's are box pushers and can't offer any solution because they really don't have one! Thanks for reading and I believe you are correct on both issues. FM, at least from what I know of it through IKON, was the closest MPS approach out there - and still is in some cases. The "Assessment" comes right out of the FM playbook. And yes, we educate our clients and future prospects - that is to say we create our own demons. Unfortunately, it takes months and sometimes YEARS to un-train/re-train a customer into a Partner - not easily done. Indeed,the room is getting crowded out here in Club MPS - and yes, competition is great. I have wondered how the heck the manu's are going to balance MPS vs Equipment sales. MPS, real MPS, does not lead to more hardware placements. Thanks for the comment, keep coming back. You didn't mention who ended up getting the deal. In the post I said, "...The really unfortunate issue, these yahoo's will get the deal..."
No commitment has been given yet, but it looks like the local, Brand "C" folks will get the nod. Very interesting post, stay in training, I don't think that I would like to be a sales person for copiers, this has to be one of the hardest reps jobs out there as the competition is so high, with all the different brands out there competing for the business. The best job I had was in a remote office away from the main sales branch.I leased virtually every copier on 36 month FMV leases. I stuck to my guns when competitors tried to coerce my customers to long term leases. I studied the lease tricks and GAAP to help keep my customers from the common pitfalls. ie: personal property tax charges and end of lease charges. I was numbero uno in sales for years. Alas when senior management required us to use only authorized lease "partners" my control went away. The kickback from the lease company to Manu along with cruise parties,and extremely inflexible end of lease returns were too much. I began to see "upgrades years before the lease end for no reason other than the need to sell something for month end. Add-ons of additional equipment which the sales manager was getting a bonus on and the customer did not know about. My boss made us put a fax in on every deal even if customer did not need one. He then put them in his garage for spiffs later! My largest account was a pure rental which our Sr. VP sold the rental paper to a lease company so we could treat this a sold deal, thus paying huge bonuses to Sales Mgr and up the chain. This sliminess is not exclusive to dealers but well coiffed branch and VP levels of Manufacturers as well.It was too much. The only way out is MPS with a non hardware focused vendor. There are certainly some dealers and branches who conduct themselves with honesty and integrity but after being a part of this for 25 yrs I would say not most. Yeah, what you say and what you saw were and probably are not uncommon. But that is the bad side of the small, independent dealer - either in the copier industry, Print for Pay, or computer integrator. Small business is full of all this kinda crap. Wow a garage full of fax machines, paid for by clients - that is illegal. Thanks for reading and keep coming back. This article is almost to relevant. Just today I pitched our program to an FCU IT manager who said that a company (one of our competitors) sent over a copier salesman to pitch their "MPS" program and to do an analysis of their machines last week. He said their numbers were almost equal to what they are currently spending by "doing things how they have been"
Due to this fact he said that he did not want to waste time with any other companies who are doing the same thing and will stick to "what works"
That IT guy, he ain't all that smart, is he? I mean, to be convinced by a copier schlep? In my opinion, let him go. Does not sound like he has a choice. Well I am working another angle on them in a couple weeks but honestly I have at least three other prospects who do "get it" so if nothing comes of it. The challenge is starts with what is MPS, many people have rebranded the same thing they have been selling for 20 years as MPS and not changed much in terms of their approaches especially as changing a box shifters culture is too difficult to change in many cases, this services stuff does not compute.